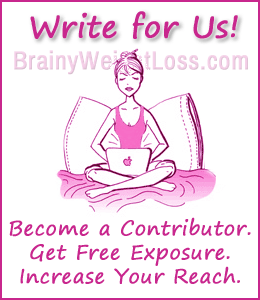 Write For Us: Want To Be A Guest Contributor at BrainyWeightLoss.com? Want to share the limelight with us? Write for Us! What’s in it for YOU? Exposure & increased reach. The exposure and increased reach that we can give you through our highly popular brand and discerning audience: over 100,000 visitors per month (in fact, we’re on top 0.5% of all sites on the web). – Smarter people looking for practical strategies for eating and exercising to lose weight, along with useful tips for implementing the lifestyle changes necessary to solve hormonal and emotional imbalances responsible for their weight loss resistance. …and we are looking for new and exciting voices to speak to our site visitors and newsletter subscribers. Would you like to expand your own reach and become a guest contributor (perhaps even a regular one) on BrainyWeightLoss? Then we’d love to have you! We almost never pay for occasional articles. Why? Simply because we don’t believe in buying content BUT, we’re offering something much more valuable: your article published on our site with full attribution. This means your signature in a small bio with links (typically nofollow links, as per Google’s guidelines) to your website and/or social profiles, which gets your content in front of new audiences, creating new opportunities for engagement and conversions for you. PLUS, we regularly promote our contributors in our Ezine. This means even greater exposure for you and an increased audience for what YOU have to say (and sell), for quite a long time. Is this valuable to you? Then come on board! More voices. More contrast. More diversified content focused on advanced strategies for healthy weight loss for people who need to get the extra pounds off. Do you qualify to write for us? First – are you an experienced member of the health, wellness or fitness community? Whether you’re a fitness/wellness trainer or coach, a health/nutrition professional or student, a weight loss expert wanting to share your unique expertise and tips, we’re offering you the opportunity to get the exposure that comes with being aligned with a recognized brand. Second – are you established on social media platforms such as Facebook, Twitter, G+? If you’re actively building your personal or professional brand on social media channels connecting and sharing with your followers your published articles, you’ll be given preference as a guest contributor on BrainyWeightLoss.com. short paragraphs grouped under a few engaging subheadings, bulleted lists or numbered items – we like bullets a lot! Outdated concepts like calories-in/calories-out, eat-less-exercise-more, etc. Promotional content – if you’re promoting a product or service in your piece, it’s probably not for us. Articles selected for publication will be edited for SEO, clarity, brevity, and to conform to the BrainyWeightLoss style and purpose. Are you ready to apply as a Guest Contributor on BrainyWeightLoss.com? IMPORTANT! submissions or offers made through the Contact form will not be considered. Please use only the form below. Include a brief bio (up to 40 words) with 1-3 relevant links in parentheses, next to the words to be linked (do not embed the links – we do it when we publish your piece). Have a recent headshot ready to email us (300 x 300 pixels and your entire head should be in the pic) for your Author Bio box – in case we select your article to be published. We’ll let you know if your article has been selected for publication within a week or so of our having received your submission. If we publish your article, we might get in touch with you about further work. If your submission doesn’t fit the guidelines above it won’t be selected; if that’s the case, you may or may not hear from us, depending on how crowded our inbox is. Send us your article for review & publishing!